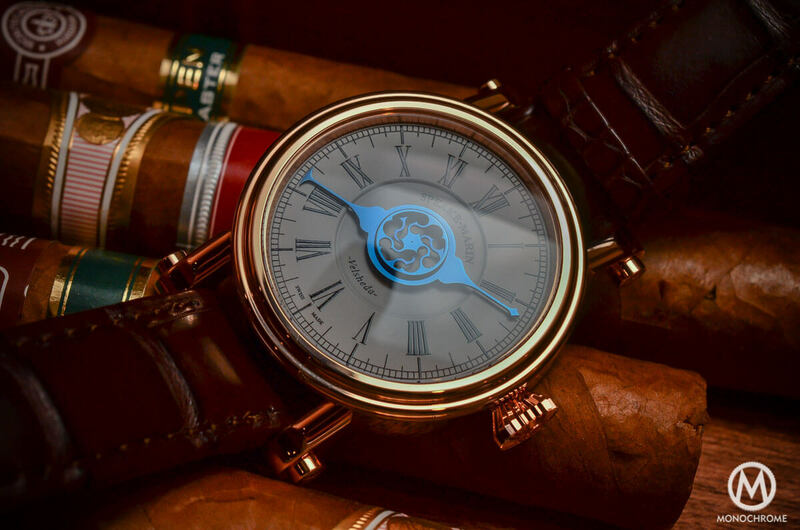 Single-hand watches are rare birds in the industry. Besides being filled with a certain outdated felling, they can’t be seen as the most practical timekeeping instruments. Clearly, reading time on a mono-aiguille watch can be disconcerting at first – but at first only. 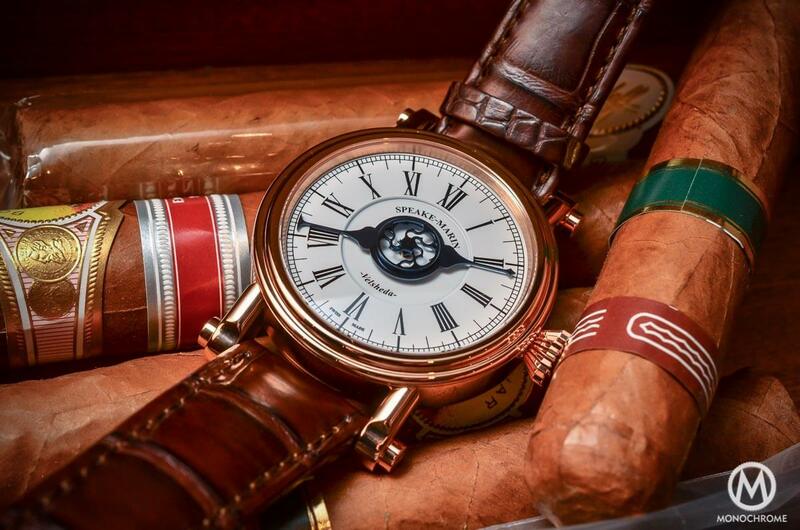 Peter Speake Marin knows it and also knows how elegant such a watch can be. 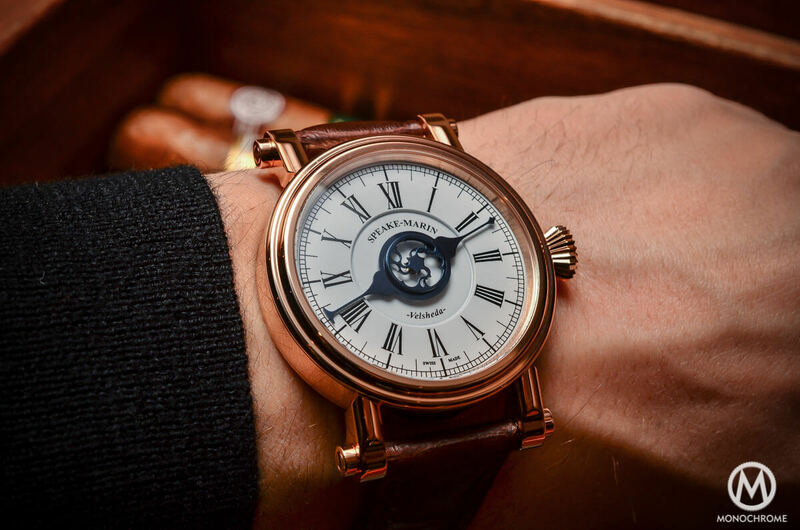 Last year, he introduced his own interpretation of a mono-aiguille, the Speake Marin Velsheda, that comes this year with a red gold case (instead of titanium) and a new movement from Vaucher. 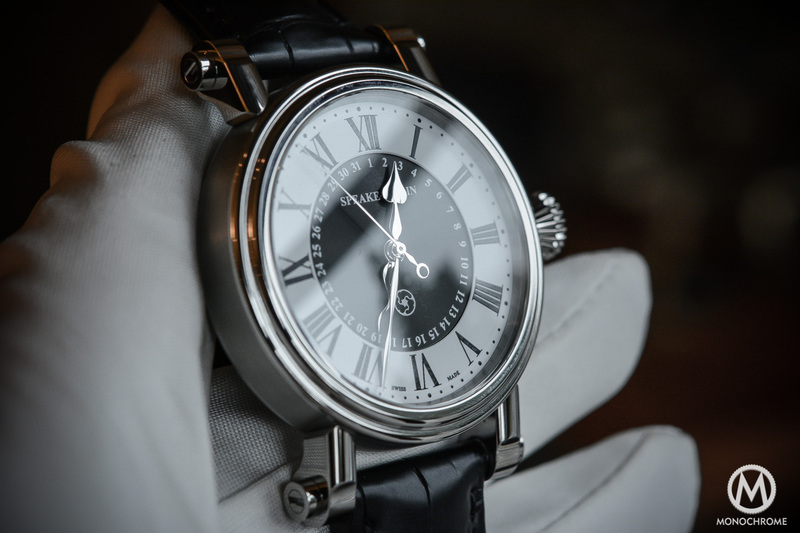 As said in the introduction, a single-hand watch has a certain unique feeling, an outdated elegance – in a word, it is a charming object. It is also, for some non-initiated people, an intriguing watch that is usually defined by its lack of readability. The idea to read both the hours and the (approximate) minutes by the mean of only one pointer is disconcerting. However, if you take a look at MeisterSinger – the main ambassador for such timepieces – you’ll quickly discover that using a single-hand watch is in fact easy and not that imprecise. Of course, you won’t be able to differentiate 9:06 from 9:07 but, really, who cares? The closest 5 minutes are more than precise enough. 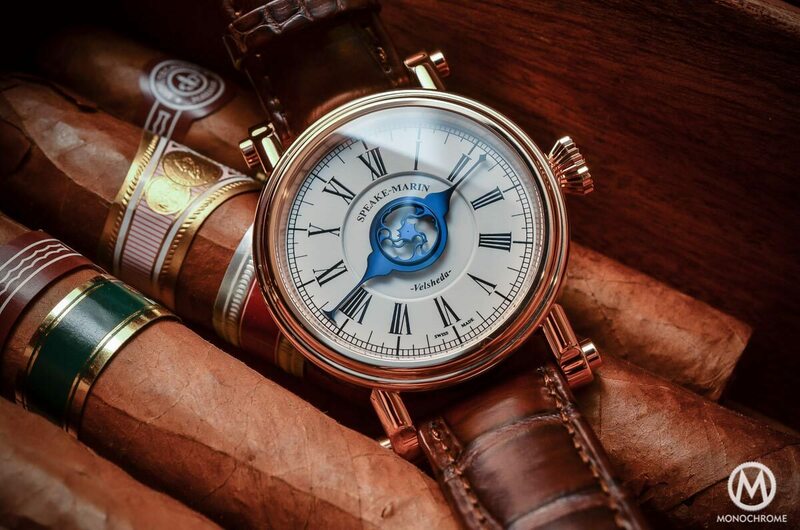 The Speake Marin Velsheda is part of the J-Class collection that boasts the elegant, dress watches – the two other ranges are the Spirit Collection (with the Spirit Wing Commander or the Spirit Seafire) and the Cabinet des Mystères Collection (with the unique pieces or the limited editions and eccentric watches like the Triad). The J-Class range also integrates the recently introduced Serpent Calendar, the Magister Tourbillon or the now iconic Resilience. 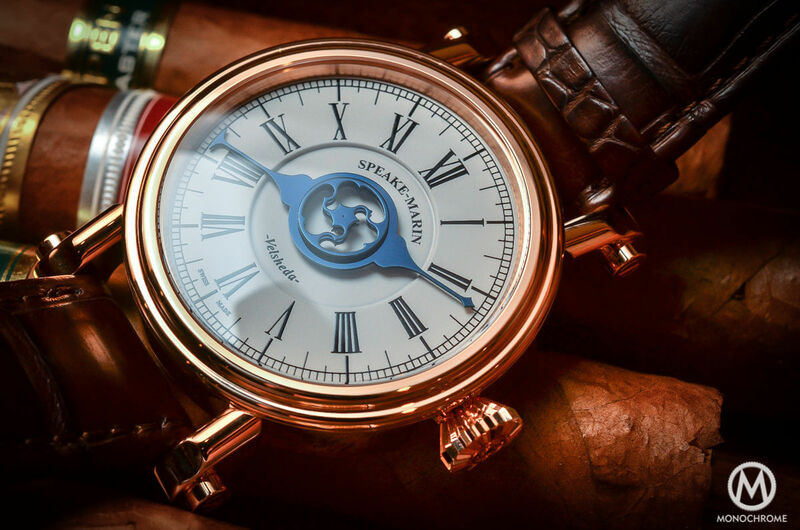 The Speake Marin Velsheda shares most of its design features with these three but brings a special feeling that breaks the classical codes of the rest of the collection. 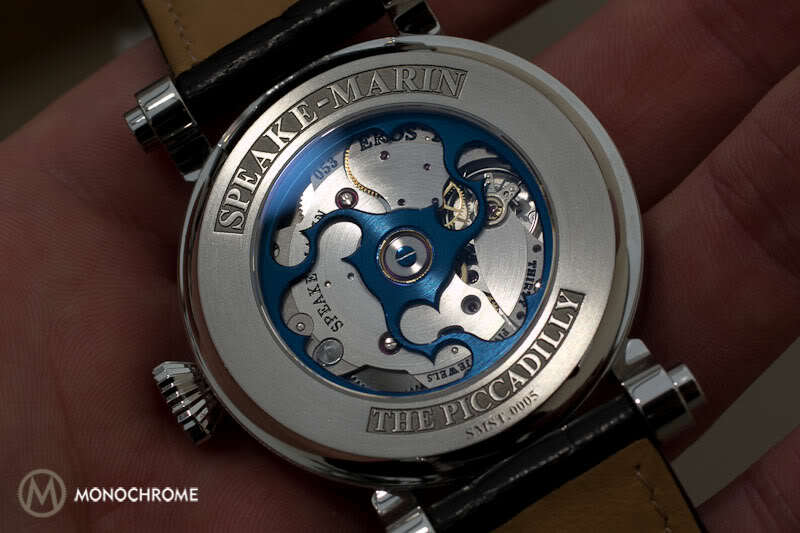 Thus, it means that it comes with the superb Piccadilly case, so dear to Peter Speake Marin. 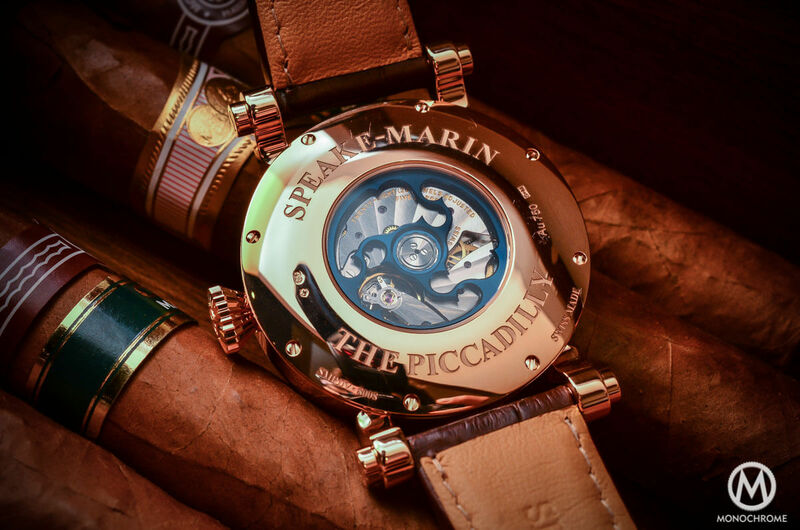 The Speake Marin Velsheda is based on PSM iconic case, a simple round central case with flat casebands and a large dial opening. The long, round, sculpted lugs with screwed strap attachments are the main interest of this case. It creates a strong visual concept that differentiates the brand from competitors and makes a PSM recognizable in a wink. Usually available in two sizes – 38mm and 42mm, like for the Resilience or the Serpent Calendar – the Speake Marin Velsheda only comes in 42mm, for an obvious reason: legibility. The explanation is simple, the smallest a dial, the shortest the hand and the closest from each other the indexes will be. Then, it seems complicated to mix a decent readability of time with a (rather) small dial. Even if the 38mm case had always been our favorite here at Monochrome-Watches, the 42mm is here more appropriate. Novelty for 2015: this case is now available in both grade 5 titanium (since 2014) and now in warm and luxurious 18k red gold. The large multiple layer dial comes in a white lacquered finish with narrowed Roman numerals printed and a (sort of) minute track on the edge, graduated with 5-minute intervals. 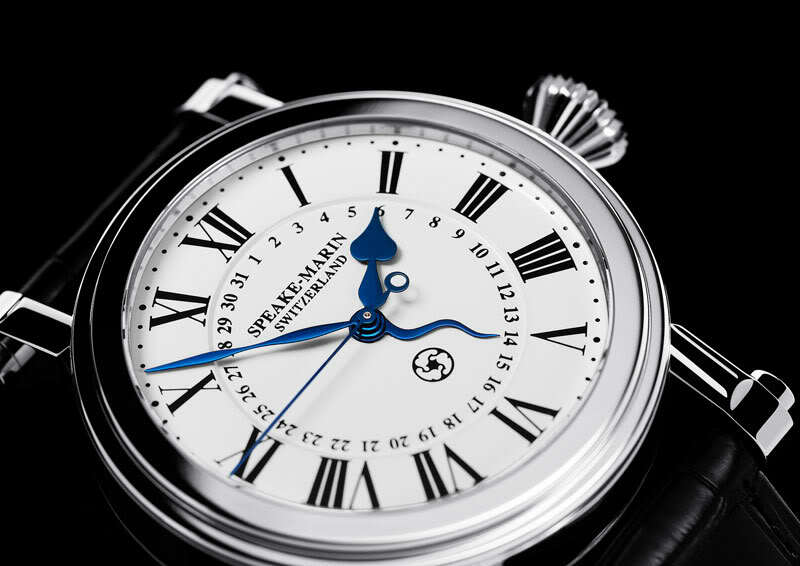 On the top of it runs a large blued single-hand that covers the entire dial from one side to another – and that points the minutes and hours by an small arrow. In the middle sits the running second depicted by PSM’s emblem, the topping tool. Not made to be an indicator, it’s more a feature to enliven the dial and to show that the watch is running (a single hand makes a full turn in 12 hours and thus, it’s a slow runner). As you can see, readability remains very good and after a short adaptation period, the use of a single hand is not problematic. Instead, it feels elegant and unique. 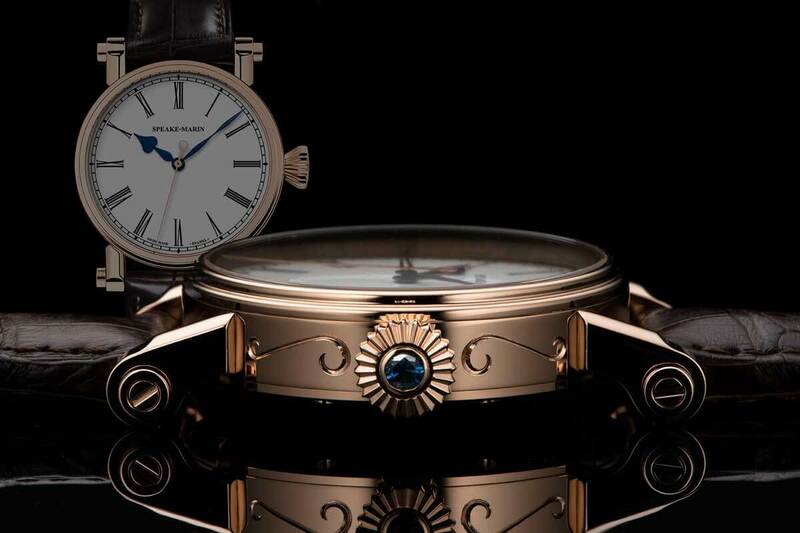 The second novelty for 2015 is that the Speake Marin Velsheda (gold or titanium) comes with a new movement. 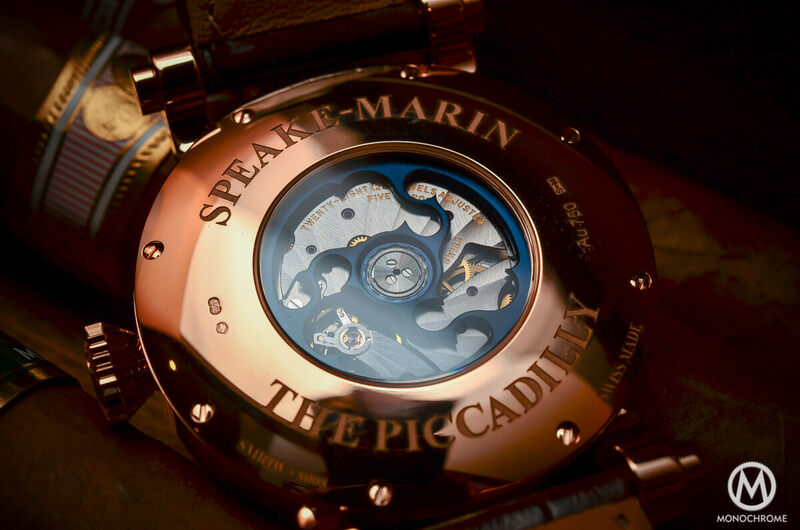 As the rest of the collection, Speake Marin decided to end the collaboration with Technotime (that used to deliver the Eros 2 movement, used for example in the Triad). Instead, as we’ve seen for the Serpent Calendar, the brand now relies on Vaucher to equip the watches. The Calibre 3002 might only boasts 50 hours of power reserve (compared to 120h for the Eros 2 / Technotime), it has to be seen as an improvement, as this new movement is more refined. First, it features a double barrel, not to improve the power reserve but for a more stable accuracy over the full range of power. Then, it comes with hand-finishings, like polished bevelled angles or rayonnantes Geneva Stripes. Finally, the quality of Vaucher is clearly not debatable. The second good news is that PSM may case an outsourced movement, they are bringing their own ‘touch‘ to it, with the blued ‘topping tool’ rotor and a specific module to run the single-hand. The only disappointment concerns the size of this movement that may seem small considering the size of the case. However, in the end, the future collectors will have a more upscale feeling with this new Vaucher calibre. 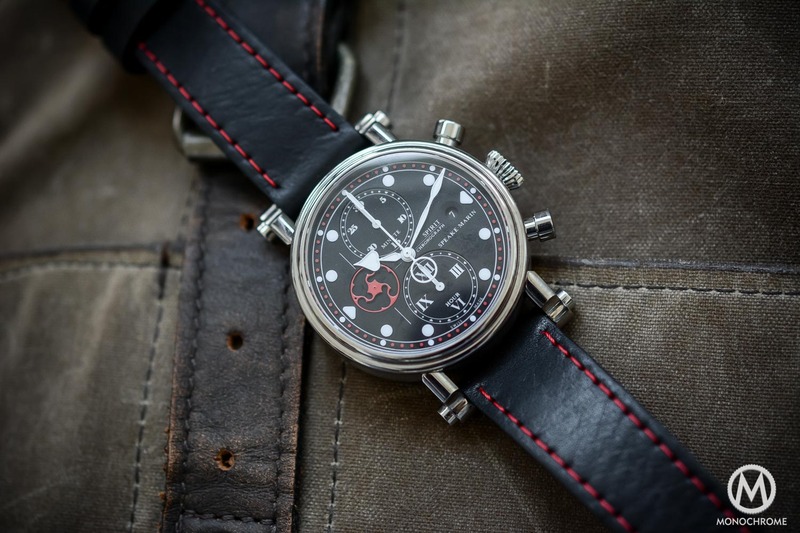 More details can be read on www.speake-marin.com.